The rose George Burns was first bred in 1996 in the United States by Tom Carruth, and later introduced commercially by Spring Hill Nurseries out of Ohio. Tom Carruth is recognized as one of the leading rose breeders in the United States and among his many achievements he has won awards for his Scentimental rose, the Fourth of July rose, and the Betty Boop rose. 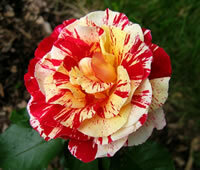 The George Burns was created by crossing the Calico rose with the Roller Coaster rose. 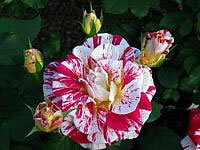 The result of this crossing is an impressive floribunda rose that produces large, full blooms that are yellowish white in color, but with eye popping pink and mauve stripes all along the petals. Each bloom can have as many as 40 petals each and they produce a strong fragrance that has a fruity citrus smell. George Burns roses will grow upwards of 30 to 42 inches tall. This rose will grow upright but stay somewhat compact and just so you are warned, it comes armed with quite a few thorns so make sure that you wear your gloves. The rose George Burns is often grown in established flower beds as a centerpiece because of its visually stunning blooms. Its short stature however also makes it suitable for containers if you would like to bring this rose onto your porch or patio. The George Burns is a repeat bloomer which means it will do its best work if you can provide it with a location that gets ample sun light throughout the day. 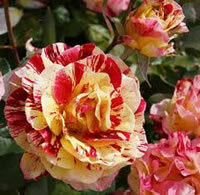 A good rule of thumb for these types of roses is to give them a minimum of 6 to 8 hours each day of direct sun light. The morning sun light is even more preferable to help burn away the dew from the leaves early on. George Burns roses are susceptible to blackspot so you should make sure that you take added precautions to keep the leaves of this rose as dry as possible. If you have to water it by hand, never water it from the top down as you will be soaking the leaves needlessly. Always try to water the base of the plant as much as possible and make sure that the soil you grow it in drains well. The rose George Burns will not do well if grown in soil that stays constantly damp all the time. Planting the rose George Burns is not at all difficult and anyone can do the job with a little ambition and a few hand tools. Before you do any digging however, I highly suggest that you pick up a bag of organic compost from your local garden center. When you dig the hole, mix the compost in with the loose soil at a ratio of 2 parts soil to 1 part compost. This stuff makes a great amendment for most soil types and your roses will absolutely love it! If you bought your George Burns roses locally, then they were most likely already planted in a 2 or 3 gallon container and probably blooming. These are real easy to plant. I like to dig the hole at least twice the diameter of the container, and equally as deep. This gives enough room all around for the new soil mix while still maintaining the same bud union depth that the rose was established with. You might have purchased your rose George Burns online, in which case it probably arrived as a bareroot plant. 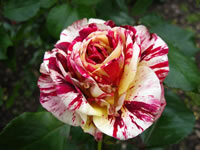 These are not difficult to plant, but there are a few added steps to help the rose get established quickly. You will need to soak the plant overnight in a bucket of lukewarm water to help wake it up. Then dig yourself a hole that is at least as wide as the longest roots on the plant, and make sure the hole is deep enough to allow you to mound up some soil in the center and keep the bud union no more than an inch or two below the surface. Set your rose George Burns on top of the soil mound and angle the roots outward in all directions, then back fill with your new soil mix about halfway to start. Take the garden hose and water the loose soil heavily until it flows around the roots like mud, then back fill the hole the rest of the way. Give it one more heavy watering to ensure that no air pockets have formed and the roots are thoroughly covered. Taking care of the rose George Burns is not overly difficult and you will have good success if you follow some basic rose care maintenance. For starters, you need to make sure that your roses have adequate water, but you don't want to keep them soaked all the time. A good rule of thumb is one deep watering per week whether Mother Nature does it for you, or if you have to water your roses manually. You can also feed your George Burns roses in the early spring with a good all-purpose granular fertilizer. For repeat bloomers such as this one, I like to give them two additional feedings per year with the second coming just as the first big bloom starts to form, and the third around the middle of the summer. Follow the dosing instructions for the product carefully as overdosing will usually cause the plant to grow rampant with sparse blooms. Pruning the rose George Burns should always be done in early spring before the leaves bud. Begin by cutting away all the dead growth as well as any canes that are overly discolored. Next, trim back any canes that overlap one another as they will eventually compete for sun light once all the leaves have opened up. Lastly, cut the remaining canes back by one third of their height to promote new growth. Always dispose of your rose cuttings in the trash and take the time to rake up any dead leaves and debris from around the base of the plant. Leaving decaying matter laying around is an open invitation for pests and diseases to attack your plants. Also never throw the cuttings into the compost pile as some spores will survive even the cold winters to re-infect plants the following season. Finish up by giving your rose George Burns a nice layer of fresh mulch to help protect it for the coming growing season.